"Objection!" Ah, that famous expression heard many times in each and every one of the Ace Attorney games truly makes gamers' faces light up with joy. 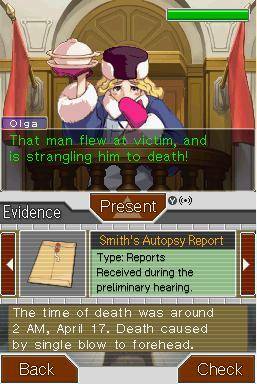 The Ace Attorney series has had a strong showing on the Nintendo DS ever since the first Phoenix Wright game released in North America in 2005. Apollo Justice (Capcom, 2008) marks the fourth entry in the Ace Attorney series, and unlike the previous three games, it stars a brand new main character other than Phoenix Wright. Besides the new characters, does this game stray far from the formula already standardized in the games before it? 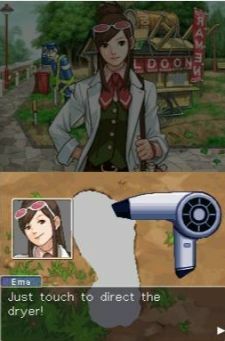 If you've never played an Ace Attorney game, the basic gameplay centers on a defense attorney as the main character (in this game, he is Apollo Justice), gathering clues and evidence at a crime scene (usually a murder) and other related areas, which must then be presented at the right time during a trial to prove your client's innocence of criminal charges. Every game in the series is heavily text-based with lots of dialogue between the different characters, and the player will navigate and advance the story by examining their environment by dragging and clicking the bottom screen cursor (the entire game can be played with the touch screen like the previous games). For better or worse, Apollo Justice follows the standard Ace Attorney formula for the most part, though there are some surprising twists toward the end of the game that are definitely fresh ideas not seen in the previous games. As usual, you still investigate your environments, where you tap a cursor at various spots on the background (which consists of a still image or sometimes two images that you view one at a time), often finding physical items that are filed into your dossier as 'evidence.' You choose to 'converse' with people during your investigation; you don't actually have any inputs to what Apollo will say; instead, Apollo will ask the appropriate questions to gather the info he needs, though people aren't always willing to talk. As a result, you may have to squeeze the truth out by showing them evidence you've acquired, as an example. Sometimes there are also some interesting scientific investigation methods, such as dusting for fingerprints and using X-ray to read hidden content in a paper that make use of the touch screen. However, these instances are quite few in the game. By the power of science shall we find our answer! The trial portion itself remains largely unchanged. You still present evidence and 'press' witnesses for clarification on their testimony to find contradictions. 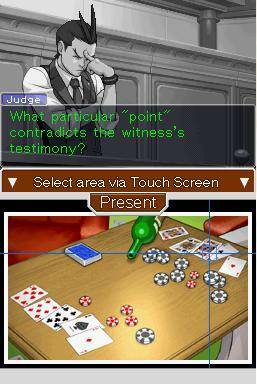 One new addition to the trial portions is Apollo's 'perceive' ability: it allows Apollo to slow down time and zoom in on the person as they talk so that you can can look for any signs of tension or nervousness, such as sweat, a muscle twitch; the smallest sign indicating the person is lying, similar to a tell in poker. The move even comes with the catchphrase, "Gotcha!" The game makes it clear which testimonies will require the use of 'perceive' but not tell you exactly which portion of the testimony to use it on, resulting in a fair challenge of looking for something that's out of place. It's a pretty interesting concept that I like the idea for but not the execution so much. It gets tedious looking for that little detail that changes, especially when your cursor movement for looking at the subject is very slow and will likely require you to repeat the testimony quite a few times. 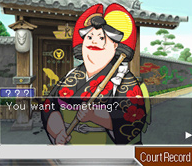 My biggest gripe with the game (and it's a problem I've had with every one of the Ace Attorney game games) is how it's possible to be absolutely stuck and unable to proceed when you can't figure out what the game wants you to do. This happened to me several times, and though I knew what evidence I needed to present, it wasn't clear what part of the witness testimony I was supposed to present it at. There were also times when the game wanted me to follow some kind of logic that really didn't make a lot of sense (in my mind). For example, there may be evidence that Apollo uses to demonstrate how there could have only been one scenario, when I can easily think of several other possibilities where that evidence isn't the be-all and end-all of the case. The problem is, you are often penalized for making the wrong input during the court trial, and if you are penalized too much, you have to start over at your last save point. Fortunately the game shows you ahead of time exactly how much of a penalty you will incur, so it's never a surprise, and you can decide if you want to take a risk with your answer. The game does feature a 'suspend game and quit,' but it's unfortunate you're forced to quit out of the game back to the title screen just to create a save point. I can understand the decision to implement the save option in this manner; otherwise, it would be too easy to plow your way through the game relying primarily on guesswork when you can quickly load your save. With the game's save system, at least you will hesitate a bit, knowing it's going to take a bit of time jumping out and then back in just because you're trying to play on the safe side. Due to the genre of the game, perhaps the most important aspect of the game that needs to be well developed and engaging for the players is the story, as well as the character development that goes along with it. Some of the cases are more interesting than others (with a total of four, which is common for the series). I felt the first case was good at introducing the story and characters while still leaving a lot of mysteries hanging in the air. The second case was just 'ok' in terms of story and characters and was my least favorite, especially with Apollo's client. The third case is where the story became quite intriguing for me, and the final case was absolutely my favorite. All the dialogue is very well-written and completely tailored to the unique personality of each character. Genuine humor abounds, especially since you can read Apollo's thoughts throughout the whole ordeal. Indeed, the characters themselves make this game shine, much like the games before it. It's always satisfying to dig deeper into each character's personalities and motives for behaving the way they do. There's quite some depth to them; bad guys are not entirely evil, and good guys may hide dark secrets. The game deals with shades of gray instead of simple black and white perspective; characters are definitely not one-dimensional or dull. Throughout any given case, you're constantly second-guessing yourself regarding what actually happened and why. The greatest satisfaction indeed comes when the pieces start to fall into place, and Apollo has figured out the truth, though he is not going to tell the player directly! The fun comes with using your own imagination and following the game's logic to discover the truth behind it all. Apollo himself is a likeable character, his only drawback being he doesn't have the advantage of having starred in three games like Phoenix and thus is not quite as well-established. The relationship between Apollo and his partner, 15-year-old magician (in training) Trucy reminds me a lot of the relationship between Phoenix and Maya Fey: she's the younger one who may seem a bit naive and have very strange observations and remarks about what is happening (and not always grasping the severity of the situation), but ultimately, despite not being all that knowledgeable in terms of law practice, ends up being quite useful to the defense attorney through her thinking outside the box or by use of unconventional means. Phoenix fans may be dismayed that Mr. Wright seems to take on a minor role not befitting his importance to the Ace Attorney game storyline (especially when you find out early on he isn't even a lawyer anymore), but I would like to point out that players have a lot to look forward to as the game progresses regarding Phoenix Wright's involvement. Regarding the overall story, it's amazing how many loose ends (if not all) are wonderfully wrapped up by the end of the game, especially all the mysteries surrounding each of the characters that has long been lingering on the players' minds. To complement it all, character animations are superb and lively! 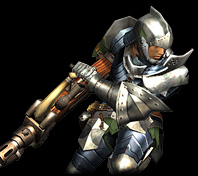 All the artwork has that standard 'Capcom look' to it that gamers can readily identify (and it seems the art assets are being displayed at a somewhat higher resolution compared to the previous DS games). The use of single screen still images for the scenery is still present and can be disappointing, especially when there's clearly something lively occurring, like someone trying to jump over a fence. Seeing that action frozen in time just looks weird and could stand to use the same animation treatment given to the characters when they converse. --- --- Contrast the lively character animations with the static environment shown in the center; yeah, that's the one jumping the fence! I didn't have the same fondness for much of the new music that replaced Phoenix Wright's games. 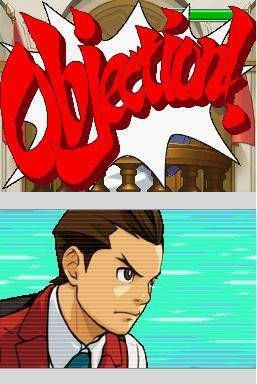 The Objection music is not bad, but I prefer Phoenix's version. Or another example: the cross examination music is decent, but Phoenix's version seems more dramatic. Other tracks like the Thrill Theme ~ Suspense and Pressing Pursuit ~ Cornered (very Capcom-y!) add to the game's excitement, but it's just that there was something endearing about the music in the Phoenix Wright games that wasn't quite duplicated in this entry. Despite the apparent 'trial-and-error' issue the game shares with the other Ace Attorney games, it also shares many of their strengths through wonderful story telling, great character development, and more often than not, clever thinking and puzzle solving. The four cases provide a good number of hours (approx. 23 or so for me) of entertainment, making this game a solid addition to the Ace Attorney games series and a welcome entry to the DS library. One very weird thing to me about this game is that it feels like they introduced this new character just to have him basically have the same personality as Phoenix Wright. And then they changed Phoenix Wright's personality. Fun game, but probably my least favorite of the original 4. I agree with a lot of what you've said in the review! And we scored it about the same - I gave it an 8.5. I really enjoyed the final case the best, it really made everything you did over the course of the game feel "worth it." I was also a fan of how much usage Capcom got out of the DS hardware this time around; FMV sequences, 3D dioramas, and the new "Perceive" ability made good use of the touch screen. Good stuff. I was late getting to this game, but I'm happy I played it, and I enjoyed it from beginning to end. All in all, I agree with the review! Nice job! Cool, I'm really glad you checked out my review and thanks for the feedback, much appreciated! Looks like we're about on the same page with the game. 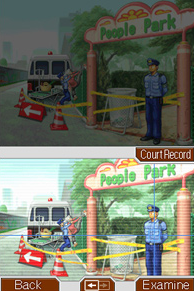 I am looking forward to playing Dual Destinies, I'm just not sure when I'll get to it! I sort of enjoy Phoenix moving on to be the mentor/mysterious character. I like that the Ace Attorney world has a loose continuity to it, and Phoenix can't be the plucky underdog forever when he's winning impossible cases left and right. 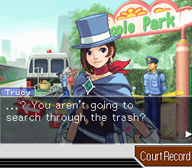 And like you mentioned, Apollo/Trucy was almost a carbon copy of Phoenix/Maya, so it's not exactly a drastic change in dynamic. One of the bigger changes was the prosecutor/detective dynamic, but I thought it was a good change of pace. I love Gumshoe's enthusiastic buffoonery (especially in complement to the exasperated Edgeworth) but it was nice seeing Ema Skye again as a reluctant, aloof detective who didn't quite hit the target she was aiming for when last we saw her. And hey, look at this, it's a prosecutor who isn't some scowling sad sack waiting for the defense to soothe his dark past and renew his outlook on life! Cleaner sprites, fun touchscreen distractions, and what I thought was the strongest humor in the series...Like I mentioned in the discussion thread, AJ might actually be my favorite game in the series, and I know I'm pretty much alone in that. I really enjoyed it, and it *might* be my favorite, too. I'll get back to you on that after I play the new 3DS game!